Set around a tree-lined quadrangle in downtown Springfield, the world-class museums that comprise the Springfield Museums provide visitors with a wealth of exciting imagery and inspirational artwork. The nationally accredited and Smithsonian-affiliated consortium of museums includes the Springfield Science Museum, the Michele and Donald D’Amour Museum of Fine Arts, the Lyman and Merrie Wood Museum of Springfield History, the George Walter Vincent Smith Art Museum, the Dr. Seuss National Memorial Sculpture Garden, and the Amazing World of Dr. Seuss, the first and only museum dedicated to the beloved children’s book author and Springfield native. 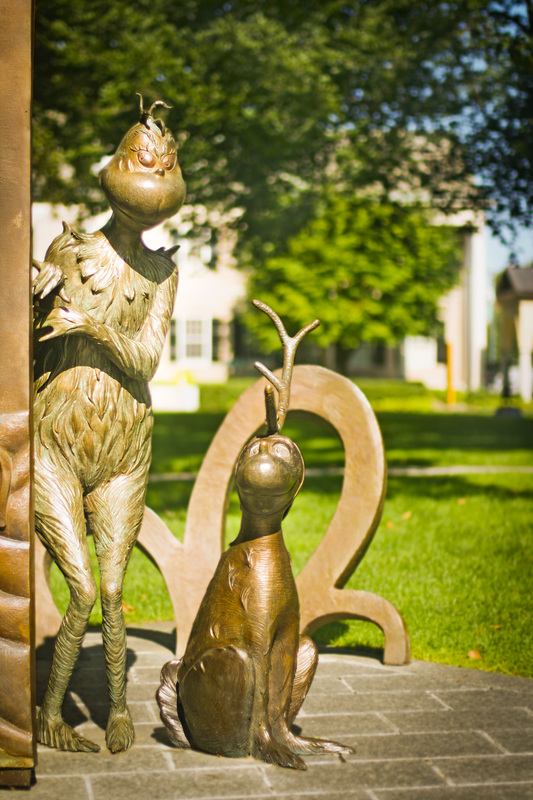 The Quadrangle is also home to the Dr. Seuss Sculpture Garden, a series of full-scale bronze sculptures of Dr. Seuss’s whimsical creations, honoring the birthplace of Theodor Geisel, a.k.a. Dr. Seuss. For one admission price, visitors can enjoy all 5 Springfield Museums and the Dr. Seuss Park. Secure free onsite parking is available around the corner at 21 Edwards Street. Open Tuesday through Sunday. The Dr. Seuss National Memorial Sculpture Garden at the Springfield Museums in the city where Theodor Seuss Geisel was born and which appears to have inspired much of his work. Sculptor Lark Grey Dimond-Cates, who is also Geisel’s step-daughter, created the endearing bronze sculptures of Dr. Seuss and his most beloved characters. See the “Story Teller” himself along with the Grinch, the Lorax, Thing 1 and 2, Horton, and Yertle the turtle! Free to see and open daily. See vintage Indian Motocycles at the Museums. Among the rarest Indians on view is the 1904 blue Indian designed and owned by Indian co-founder Hedstrom. When he left the company, he took this motorcycle with him, and it was later passed on to his granddaughter. Also featured are Indian racer and dealer Stanley Cornell’s unique 1912 board track cycle with its original board track racing tires; an entirely restored, operable 1929 101 Scout; and a 1927 hill-climber. The collection also includes artifacts, memorabilia, and photographs highlighting production of Indian’s “everyman” and military motorcycles from the early years at the famous “Wigwam” through the final days of the downtown Springfield factory in 1953. See Tiffany Stained Glass Windows Newly refurbished. Among the most celebrated features of the Smith Art Museum are its original Tiffany stained glass windows. Manufactured by the Tiffany Glass Company of New York City, the windows were installed in 1895 as the museum was being completed. The windows are rare examples of Tiffany work commissioned for a museum building; the only other known windows made especially for a museum were at the Henry Field Memorial Art Gallery at the Art Institute of Chicago and have not survived. The Springfield Museums are pleased to welcome veterans and active duty personnel to the museums with a complimentary ticket all year round. After showing their military, work ID or badge, veterans and active duty personnel may receive free admission to the Museums. During the summer months, Memorial Day through Labor Day, the Museums participate as a Blue Star Museum, offering free admission to the nation’s active-duty military personnel and their families, including National Guard and Reserve. Skygazing in the Science Museum’s observatory. Join members of the Springfield Stars Club for skygazing in the Science Museum’s observatory. Mar. 1, 2019 SOS: Ed Faits: Comets, Asteroids and other Wanderers. First Friday of the Month, 7:30 pm. $3 adults, $2 children. If overcast, a planetarium show will be presented. Apr. 5, 2019 SOS: Marguerite Seuffert, Crystal Mengele: Stars Game Night May 3, 2019 SOS: Richard Sanderson: Apollo 11: A Look Back at Humanity’s Greatest Achievement. Visit the Stars Club website for speakers and topics. First Thursdays, bi-monthly, 5-8 pm includes hor d’oeuvres, entertainment, and cash bar. 4.4.19: Festival of Flowers See the museums in bloom! View spectacular arrangements inspired by objects throughout the art, history, and science museums. While touring each museum, enjoy cocktails and hors d’oeuvres. 6.6.19 Indulgence: An Evening of Wine and Cheese Enjoy live music on the Quadrangle grounds while sampling local wines and cheeses. Members $10; nonmembers $20. Must be 21 or older. Reservations recommended, call 413.263.6800, ext. 379.